Are you having trouble turning the corners on your double fold bindings? Do they refuse to make a nice miter and lay down flat, even though the rest of your binding folds over nicely and behaves? The problem may be as simple as the thickness of your batting. Try this simple tip to solve the problem. In the corner, fold back the quilt top and back and cut out the corner of the batting only. This will reduce bulk in the corner and make your corners behave better. Here are some step by step photos. First photo shows the quilt corner nicely trimmed, before the binding is applied. 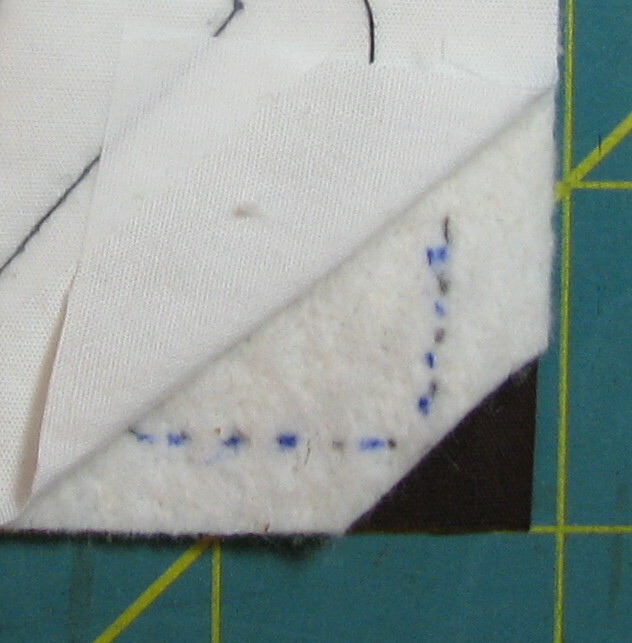 Second photo shows the top folded up and the approximate batting seamline marked. Third photo shows the batting trimmed out of the corner. After the batting corners are trimmed, apply your binding in the usual way. I think you will find the corners will behave better. Even though you may never have this problem with your normal bindings, you may find it occurs with embellished bindings, such as those with piping or an integrated flange. 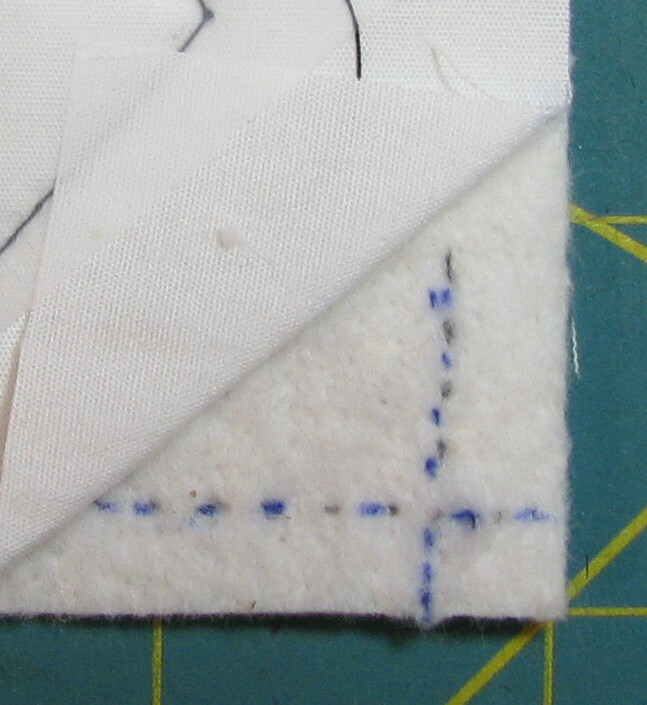 Test construction of a corner in this type of binding before applying it to your quilt. You may solve the problem by cutting out the batting, or you may find you need to widen your binding strip slightly to give you more ease. © 2013 by Shirley Sandoz and Mystery Bay Quilt Design. All rights reserved. This entry was posted in Binding, Quilt Binding and tagged binding corners, Quilt binding on April 19, 2013 by Shirley at Mystery Bay Quilt Design. Another binding comment: For those who own Pfaff’s 4.0 Expression, I found that Pfaff makes a welting foot that I think will work for attaching piping. The Pfaff part # is 820530-096. Must call one’s nearest Pfaff dealer for price. Thanks, Kathleen. That’s a good suggestion about showing how to correct the corners. If I can figure out how to explain it without a pin and a binding corner in my hand, I will post it. In the meantime, for anyone else reading this: see Figure 20 on page 17 of Fast Fabulous Quilt Bindings. That first pin shown in the outside center fold is amazingly useful for adjusting the corner folds so that the corner is nicely mitered and the binding width is even. 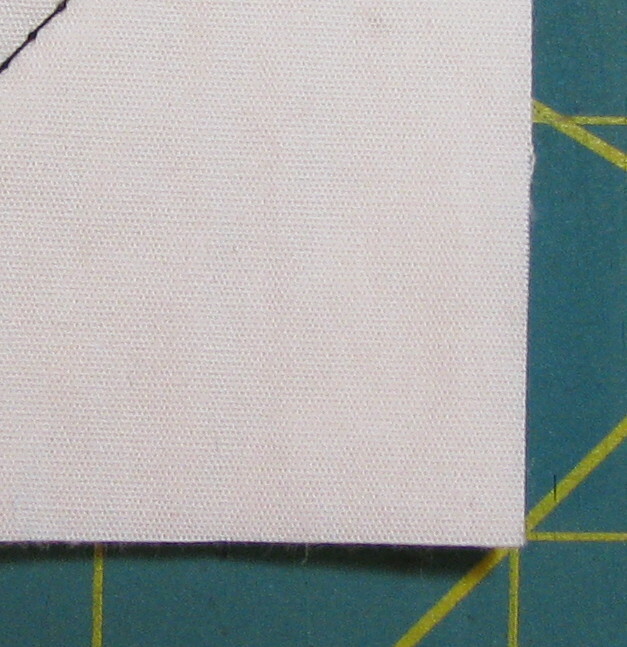 There is a lot of wiggle room for moving the binding around and tucking any excess inside the miter with that pin. Update on the Pfaff Welting Foot: A visit to the local Pfaff dealer introduced me to the Piping Foot – $29.95 — far more suitable for sewing 1/16″ piping!